That’s a very questionable photo. It’s looking west across the river, but the eclipse was in the east. yes, you’re right – this is a Photoshop composite. I know because I’m the guy who took the photos and did the composite and this is just a rough draft of what became the final one. And, I’m not sure how it ever got to this blog – I never released it for any kind of publication or re-use, although I did e-mail it to a few friends. 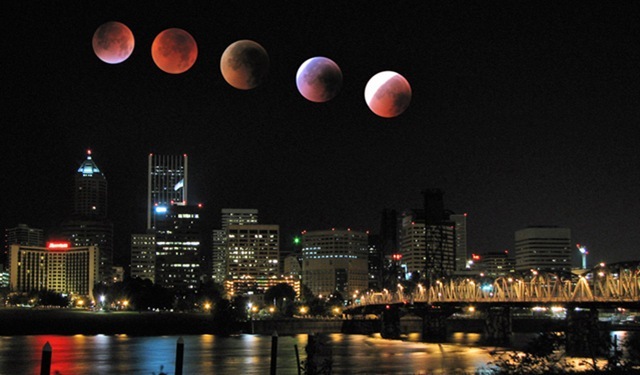 Anyway, the photos of the moon are all real from that morning and they were shot from the east side of the Willamette River near OMSI. The photo of downtown is real and from that morning as well. But yes, the moon never appeared that night in the orientation shown, nor the size shown, nor over the city as shown. The image is not, by any means, astronimically accurate. It was meant as art only. A very successful piece of art, I might add. Ed, if you would prefer I’ll remove it from the blog. I found the original at the location hyplinked in the attribution.